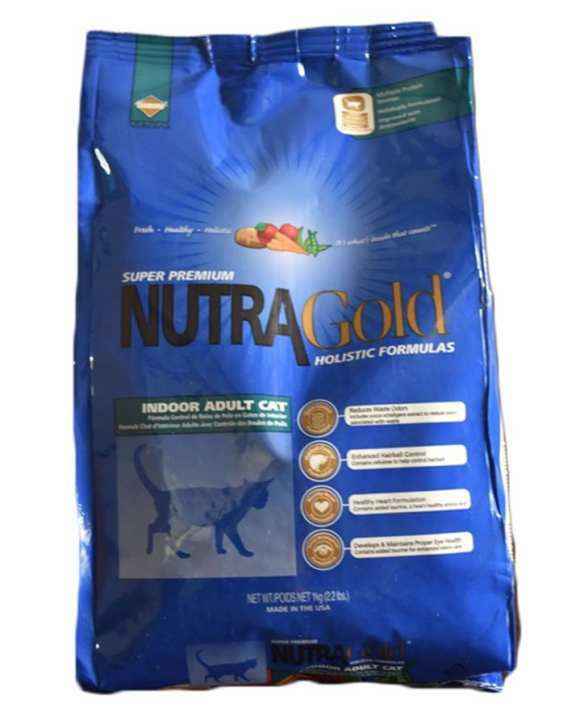 NutraGold Dry cat food is specially designed for adult indoor active cats. This premium balanced diet is best to keep cats healthy. NutraGold Dry Cat Food can be used as diet food for prevention of hairball in cats. NutraGold Dry Cat Food is completely magnesium controlled and pH balanced diet. It is highly recommended by vets for all adult indoor cats. Most recommended NutraGold Dry Cat Food is the best for cats with hairball as it helps in hairball control. Salmon (Cat’s most favorite ingredient), chicken, natural chicken flavour, chicken meal, chicken fat, spinach, rosemary extract, blueberries, yucca schidigera extract, cranberry powder, egg derivatives, Lactobacillus plantarum and Lactobacillus casei, choline chloride, linseed, ground rice, tomatoes, ocean fish meal, shell fish flour, powdered cellulose, cartilage of poultry, parsley flake, DL-methionine, Lactobacillus acidophilus, barley, millet, dried chicory root, minerals and vitamins such as Vitamin A, D and E, taurine, kelp, potassium chloride, dried fermentation products, sodium bisulphate, dried Trichoderma longibrachiatum and omega-3 & omega-6. I’ve always ordered from this page. Fast delivery. And reasonable rates. what is the expiry of the bag of 3kg?